Among the societies of Central America, gold ornaments were important symbols of power and prestige that expressed authority and status in life and in death. Made to be worn across the chest, gold disks and pendants were still worn by local inhabitants of the Caribbean coast when Europeans encountered them at the turn of the 16th century. 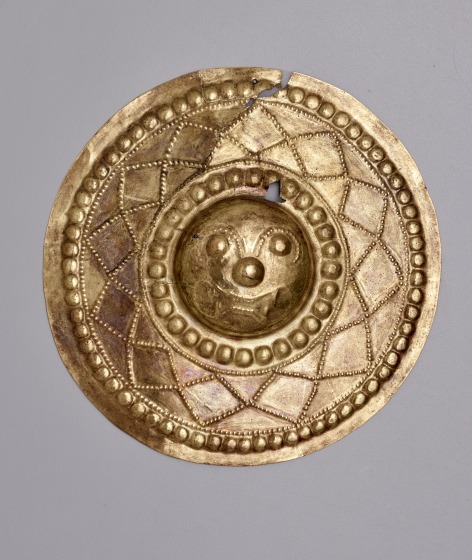 The small hole at the top suggest this gold circular disk would have originally been worn hanging over the chest as a pectoral either fastened to a neckband or garment. 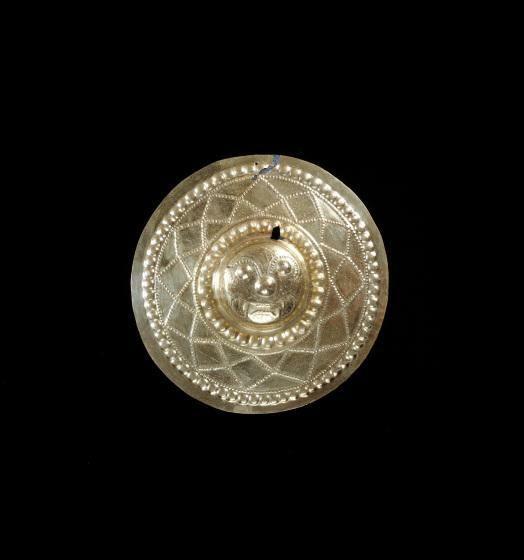 Often referred to as patenas, many examples of such pectorals have been found from this region and are usually similar in size with simple decoration of raised dots around the rim and highly polished surfaces. Others feature figural designs and large bosses, as seen in this example. 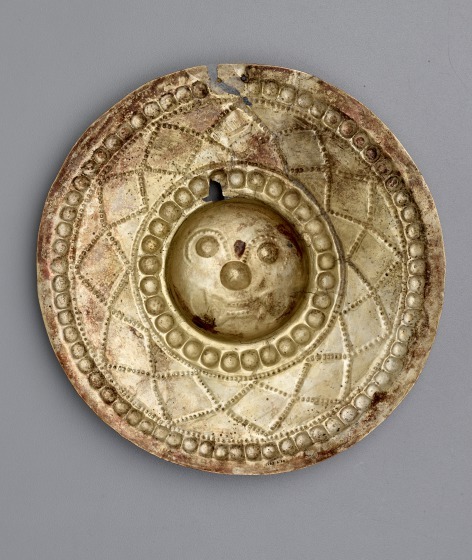 The image is flattened and bilaterally symmetrical for maximum decorative effect and features a large central boss with a feline head surrounded by a series of dots and a dotted diamond motif and another band of dots around the edge. The goldwork attributed to the Milagro-Quevedo and Manta cultures of western Ecuador has much in common with ornaments made by the Capulí culture in the Nariño region of southwestern Colombia; circular pectorals and ear ornaments with a central human or feline head in high relief are hallmarks of both styles. Felines, a common theme among the cultures of Intermediate Central America, are depicted in a variety of sizes and styles and sometimes represent a fusion of various animal features and species. Though their exact meaning is unknown, gold objects such as these were likely worn on ceremonial occasions, and would have created a dazzling golden image. For many peoples of the ancient Americas, jaguars and other large felines were likely considered mythic figures. Feline ornaments may have thus offered protection to the wearer, and when represented in gold, such as this example, they are even more powerful. Carol Robbins, "Disk with feline head (1983.6.FA)," in Dallas Museum of Art: A Guide to the Collection, ed. Suzanne Kotz (Dallas, TX: Dallas Museum of Art, 1997), 177. Carol Robbins, "Pendant depicting a figure with batlike mask (1976.W.237)," in Dallas Museum of Art: A Guide to the Collection, ed. Suzanne Kotz (Dallas, TX: Dallas Museum of Art, 1997), 181. "Pectoral Disk (Patena) (1977.187.28)." In Heilbrunn Timeline of Art History. New York: The Metropolitan Museum of Art, 2000–.https://www.metmuseum.org/toah/works-of-art/1977.187.28/. (August 2009).